#epicplaytime for children of all ages! Track Party can builds the biggest train track in the world, AND you can touch it! 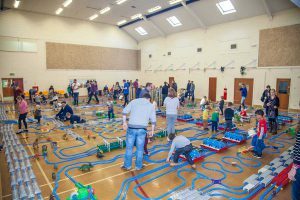 Track Party has created #epicplaytime, a new way to entertain large groups of children all at once using trains, cars and dinosaurs. If you want a ‘wow’ factor for your guests, friends, family or customers then you have found it! We give children the chance to experience a playtime on an epic scale. We build it & all you have to do is buy a ticket & get yourself down to one of our fabulous events. 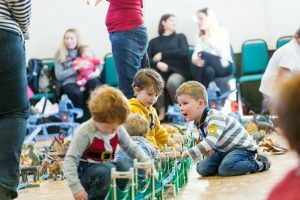 Trains, cars and dinosaurs are provided so you’re sure to have a stress free experience at one of our events, our tracks are even repaired after mishaps so you don’t need to worry at all, it’s what we are here for! Be sure to keep an eye on our website & our Facebook to be updated with information such as new events & videos & images from our latest parties. If you have any questions do not hesitate to contact us, we will be more than happy to answer them & make your Track Party experience the best we can possibly make it. Epicplaytime 4 – Easter Special! © 2016 Track Party. All Rights Reserved.